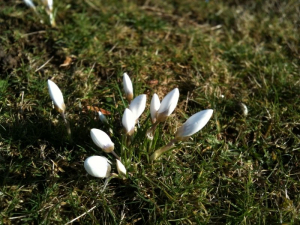 Observation - Crocus signs of Spring - UK and Ireland. Description: Saw these crocuses in front of Walton Hall at the OU on my way to an iSpot team meeting on a beautiful sunny morning - at last, Spring seems to be on the way! Saw these crocuses in front of Walton Hall at the OU on my way to an iSpot team meeting on a beautiful sunny morning - at last, Spring seems to be on the way!